I haven't reviewed a jerky product since that uncured Srircha Bacon version from Trader Joe's in May of 2015! Over a year without jerky, can you believe it? My eating preferences have always leaned more towards the veggie side, but even though I'm dating a vegetarian, I'm still an omnivore who LOVES chicken wings, bacon, and jerky. A while ago Aldi had these fancy flavored jerky bags in their Special Buy section and since I was craving jerky, I bought all three bags. Time to break my year-long jerky-drought with some "Artisan" Fusion Jerky! Smell: There's a healthy dose of lime juice in here for sure! The lime punches you right in the nose with it's tangy citrus notes, followed by a dry spicy chipotle pepper aroma and a hint of cracked pepper (the seasoning). Texture: This flavor was the softest and easiest to chew of the three. Maybe the lime juice made it more tender? The pieces were small, soft, and surprisingly tender. Smell: Really sweet and meaty, I think this one is pineapple based? It has a tropical aroma and no hint of heat. It's not labeled with a heat level, but I'm guessing this one in mild and fruity. Texture: Significantly stiffer than the beef-based Chipotle Lime, but it's not overly tough or dry. (Although I had one piece that felt like I was eating an old leather shoe, so it varies.) Overall the texture reminds me of the slightly greasy Trader Joe's jerky. Taste: Pretty bland, especially when compared to the other two. 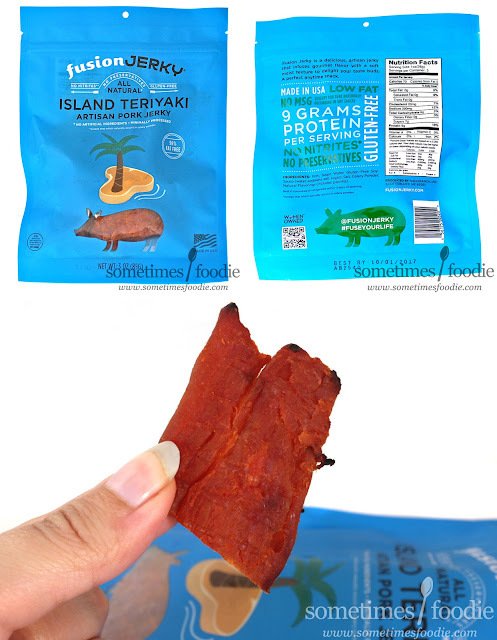 It's like dried out hamsteak with pineapple. I found it really "meh" and unsatisfying. It was my least favorite of the three, plus there was a super tough piece in the bag that felt like I was eating shoe leather. Smell: It kind of reminds me of the sauce from take out General Tso's Chicken. Sweet, garlic-heavy, and meaty. Very umami. Texture: Pretty typical for Jerky. 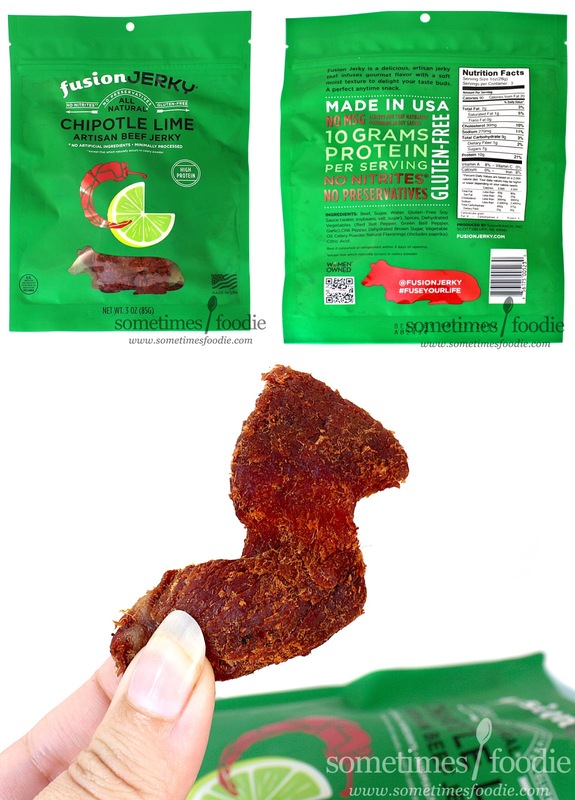 It's a little dry, with a softer bite than the Island Teriyaki, but no where near as tender as the Chipotle Lime. 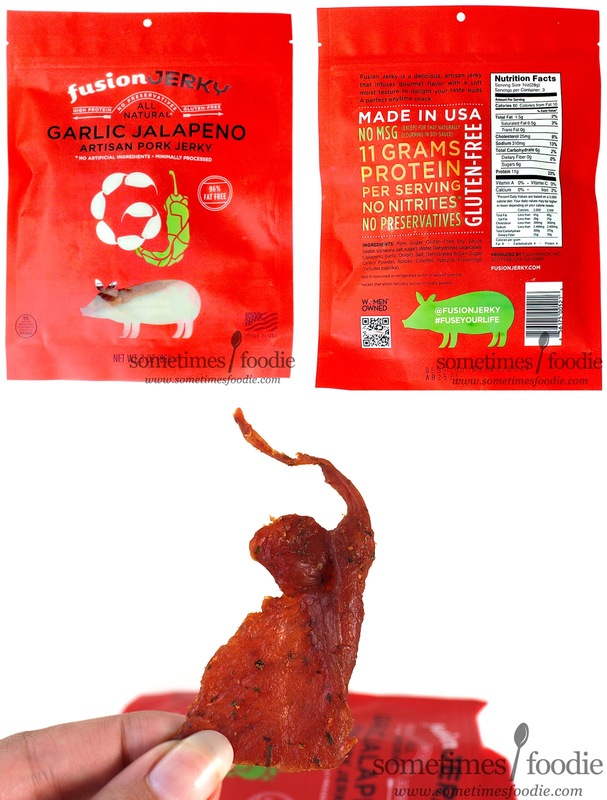 Just your average, run of the mill, chewy jerky. Taste: It's a little on the stringy side as you chew, but the flavoring is pretty nice. You get sweet brown sugar notes, with a little bit of jalapeño heat, and some seasoning that is REALLY reminiscent of Asian cooking sauces, like General Tso's chicken, or Hunan Pork. It's heat level is not as intense as the Chipotle Lime, so this is easier to snack on. Not bad at all, but I like the lime better. I totally read "Human Pork".... I need to stop watching Hannibal.